With the Asia Pacific region predicted to see the fastest e-commerce growth and mobile payments potentially exceeding $4.7 billion by 2020, almost all banks in key regions surveyed by The Asian Banker indicated plans in the next three years to materially increase sales from digital channels. Australian banks already generate more than 40% of credit card sales and source on average 21% of accounts from internet and mobile banking channels, yet banks are on a steep learning curve and financial regulators in emerging markets are still finalising the rules for branchless banking and the use of mobile money. 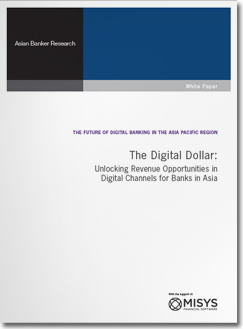 Click here to read The Asian Banker’s whitepaper ‘The Digital Dollar: Unlocking Revenue Opportunities in Digital Channels for Banks in Asia’, detailing how banks face different challenges and at what stages they stand in the digital evolution.